December 22, 2017 at 12:11 am. KICKOFF: Monday, 8:30 ET, Lincoln Financial Field. TV: ESPN, Sean McDonough, Jon Gruden, Lisa Salters (field reporter). SERIES HISTORY: 12th regular-season meeting. Eagles lead series, 6-5, including a 49-20 win at the Coliseum on Nov. 3, 2013, when quarterback Nick Foles tied an NFL record with seven touchdown passes. The last Raiders win was in 2009. The Eagles won the last game in Philadelphia in 2005. KEYS TO THE GAME: The Raiders would love to run the ball effectively against the Eagles, but that’s a tall order against a team allowing just 71.5 yards per game, the best in the NFL. Expect the Raiders to stick with it as long as they can before turning Derek Carr loose against a team with a plus-9 turnover margin. Defensively, the Raiders have improved by tailoring their defense to get Khalil Mack and Bruce Irvin going off the edge. They will load up on Philadelphia runners and attempt to pressure Nick Foles into a mistake or three in his second start in place of Carson Wentz. The Eagles will go with a balanced offensive attack, but look for Foles to get the ball to Zach Ertz early and often. The Raiders, who have the second worst opponent passer rating in the league (102.6), have struggled against tight ends. Six tight ends have had at least 70 receiving yards against them, and they have given up five touchdown passes to tight ends. –Eagles RT Lane Johnson vs. Raiders DE Khalil Mack. It’s time to break out the popcorn for this one, with the NFL’s hottest pass rusher going against one of the top players at his position. Mack is up to 10.5 sacks, has a sack in five straight games, and his 17 sacks in December since 2014 are the most of any player in the league. While Mack has refined some pass-rush moves, he remains mostly a power player who can blow up a running play or a passing play. In a matchup against Denver this season, a video of Johnson treating Denver’s Von Miller like a rag doll went viral. –Raiders WR Michael Crabtree vs. Eagles CBs Ronald Darby and Jalen Mills. Crabtree is up to eight touchdown receptions and remains the player Carr looks to most often near the end zone. The QB just fine with putting it up for grabs and believing Crabtree will be the one to come down with it. It’s notable that on the Raiders’ final play against Dallas, they had to change their call because Crabtree was off the field being evaluated for a concussion. Mills will be worth a watch against the physical Crabtree. The second-year corner out of LSU had three interceptions, 12 knockdowns and, according to Eagles stats, he is the team’s second leading tackler with 78 stops. PLAYER SPOTLIGHT: Raiders MLB NaVorro Bowman. He had nine tackles against Dallas and has led the Raiders in tackles seven times in eight games since joining the team after being released by the 49ers. The presence of Bowman, along with making John Pagano defensive coordinator over Ken Norton Jr., are the primary differences with the Raiders for their improved play over the last four games. FAST FACTS: Oakland RB Marshawn Lynch has five rushing TDs in the past six games. … WR Michael Crabtree has 100 yards or a TD catch in four of his past five games vs. NFC teams. Since 2015, his 25 TD catches are the fifth-most in the NFL. … DE Khalil Mack had two sacks last week and has a sack in five straight games. … LB NaVorro Bowman aims for his fourth game in a row with at least eight tackles and a tackle for loss. Since Week 8, he has 58 tackles, tied for sixth in the AFC. 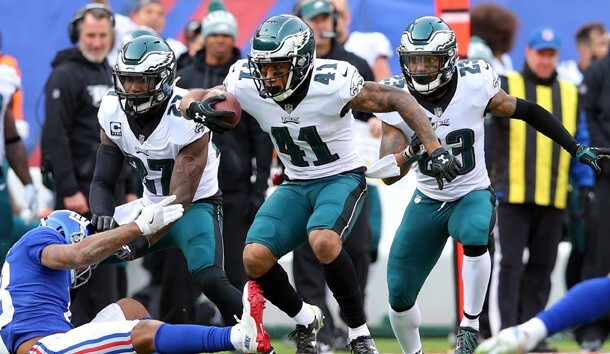 … The Eagles secured a first-round bye with their Week 15 win. They started 12-2 or better for the second time (13-1 in 2004). … QB Nick Foles threw four TD passes, with no interceptions, in Week 15. He joined Donovan McNabb as the only QBs in franchise history with multiple games of four TDs and no INTs. The last time he played Oakland, he tied the NFL record with seven TD passes. … WR Alshon Jeffery is tied for second in the NFC with nine TD catches. He has seven TDs in his past seven games and has scored in three straight home games. … TE Zach Ertz has seven TDs in his past eight games and has scored in six straight home games. … DE Brandon Graham had a sack last week and leads the team with a career-high 9.5 sacks. In his past five games, he has 4.5 sacks, a forced fumble and a fumble recovery. PREDICTION: The Eagles have scored 77 points in the past two games and have been under 30 just once in the last eight games. Oh, and they’re finally back home, where they have won their past three by an average of 26.3 points.